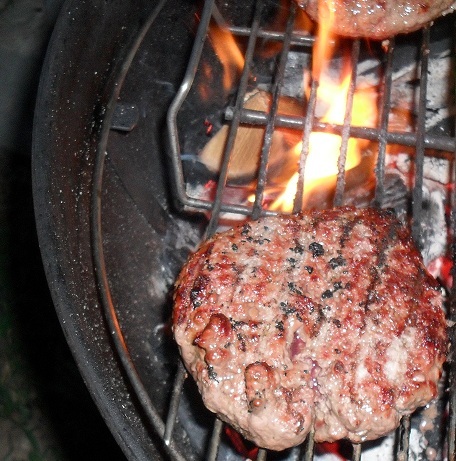 Now I know what you are thinking…”wow a freaking burger on a BBQ site, how original!” Well shut up, the burger isn’t the star here, it is the applesauce and I bet I know something about burgers that you don’t. Before you get ahead of yourself and start cooking you need to soak your wood in water for at least 30 minutes. I used small chunks of sugar maple to correspond with the flavor in the applesauce. You can also go ahead and prepare a two zone fire in your grill. We used a 22 inch Webber grill and put one who chimney of hardwood charcoal in one side, and a disposable foil pan with water in the other. This gives you a high heat side and a low heat smoke side. 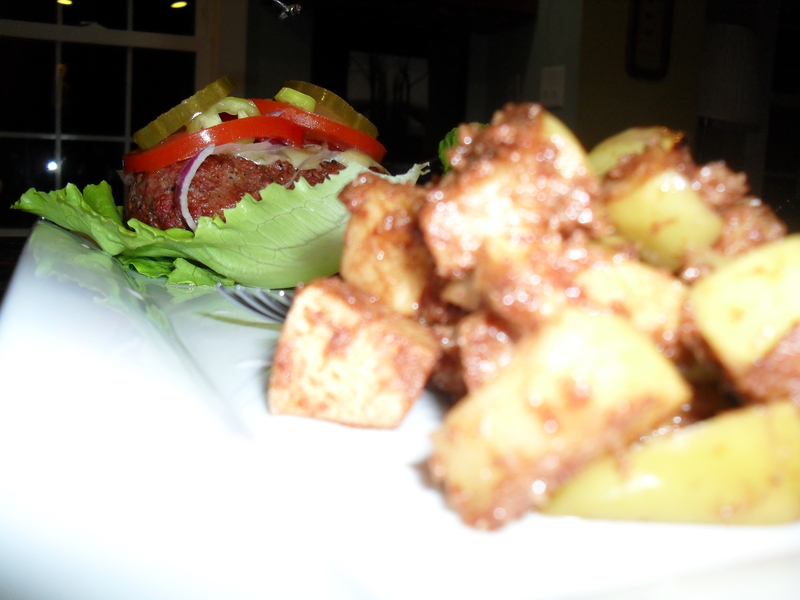 You can start by chopping up the apples and tossing them with the other ingredients in a disposable foil pan. You can use a grill friendly cast iron pan if you wish, we use disposable foil pans most because cooking over fire will ruin your nice expensive Le Cruset stuff and then you will be really cranky. Once your apples are ready and your grill is hot, put the wood into your little water pan and throw the apples on the “smoke side” of your grill. Ok don’t really throw them, be gentle. While your apples are smoking for about 25 minutes you can go inside and prepare your burgers. We used once pound of bison with salt and pepper and 1/4 teaspoon of garlic and onion powder on each one. I really don’t care what you use, if you don’t have any bison lying around use beef, or pork, or your neighbors cat (hey I won’t judge). 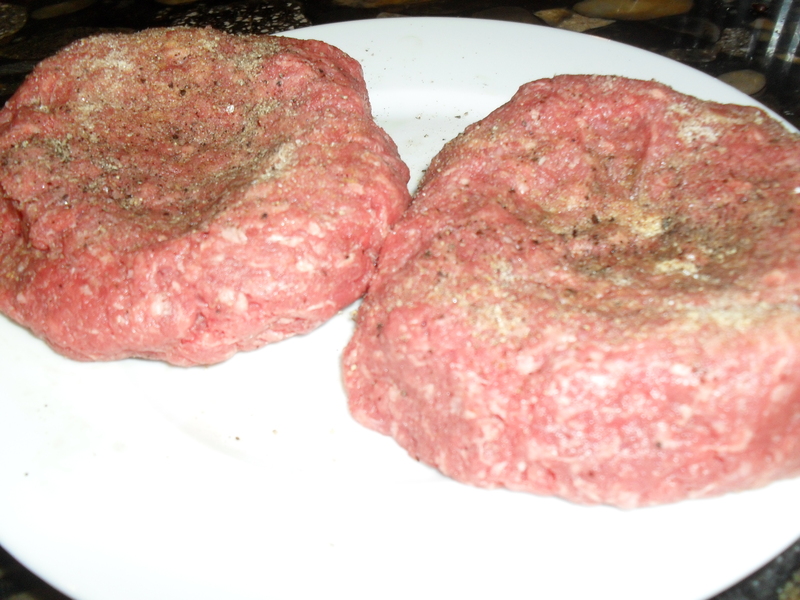 Do you know how grilled burgers come out all fat in the middle and skinny on the edges, like a big UFO made of meat? Well I have the cure. I know they’re not perfectly round, I was cooking for myself, when you come over for dinner I will make them perfect. 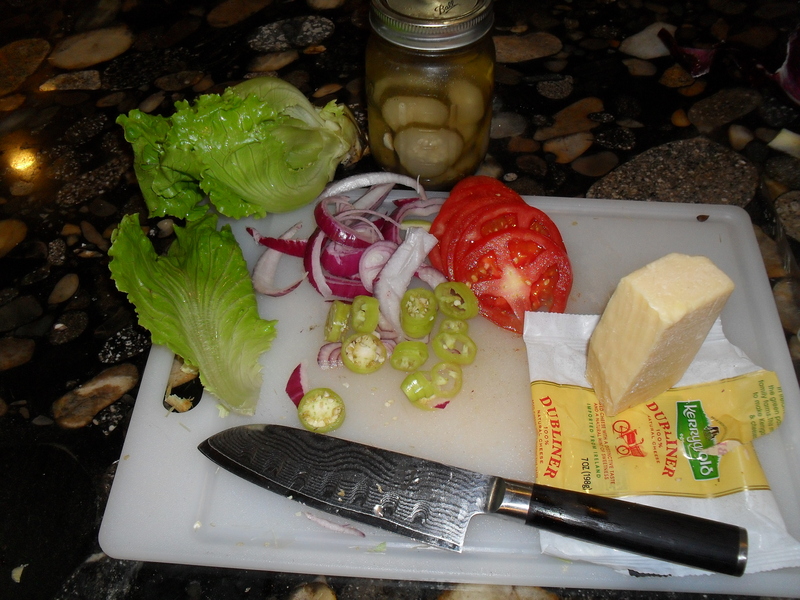 Make your burgers with indented centers, this way when they shrink up on the edges during cooking you end up with a nice flat burger that holds all your toppings nicely. Put your burgers on the hot side of the grill and prep your toppings. Cook your burgers for about 10 minutes, flipping halfway through, and don’t forget to give your apples a quick stir every once in a while. I added an extra 2TB of water to mine because they looked like they were drying out. You have to watch because you don’t want them to get dry, but you don’t really want a ton of liquid in there either. I left the extra two TB out in the beginning because everyone has water…and if you don’t what they hell are you doing on the internet? You should be paying your water bill instead of your Verizon! Priorities people! After 10 min put your cheese on (if you are using cheese, if not just ignore this part) then put the lid back on for another minute or two while it melts. 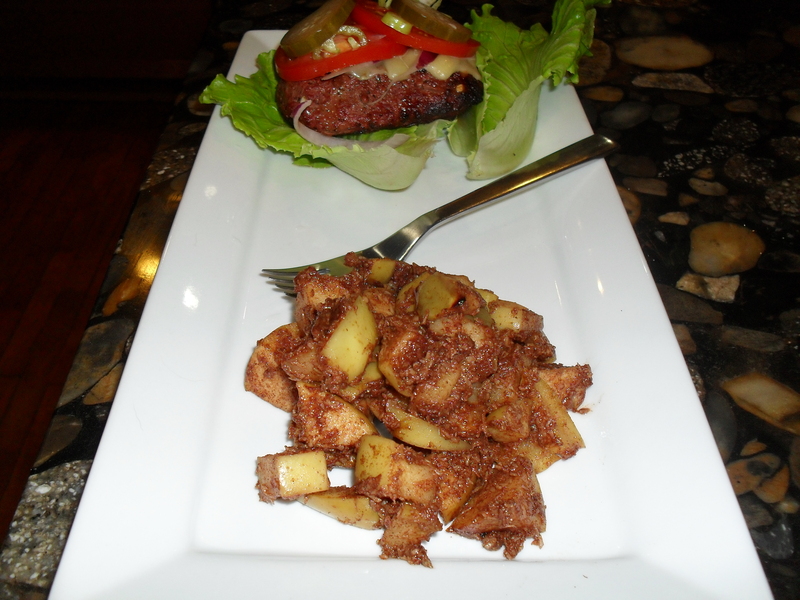 As you pull your burgers off move your apples to the hot side of the grill for 8-10 minutes. Put your burgers in the house while you finish the apples, seriously, I don’t want flies all over them walk the extra 10 feet. 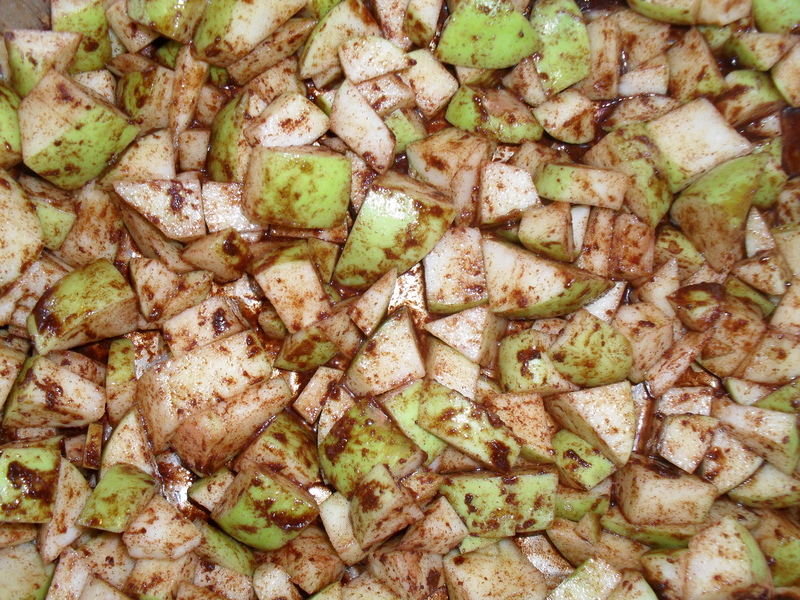 Stir the apples a couple of times and check every few minutes to make sure they don’t burn. You will know when they’re done because they will be soft and melty like warm apple pie filling. 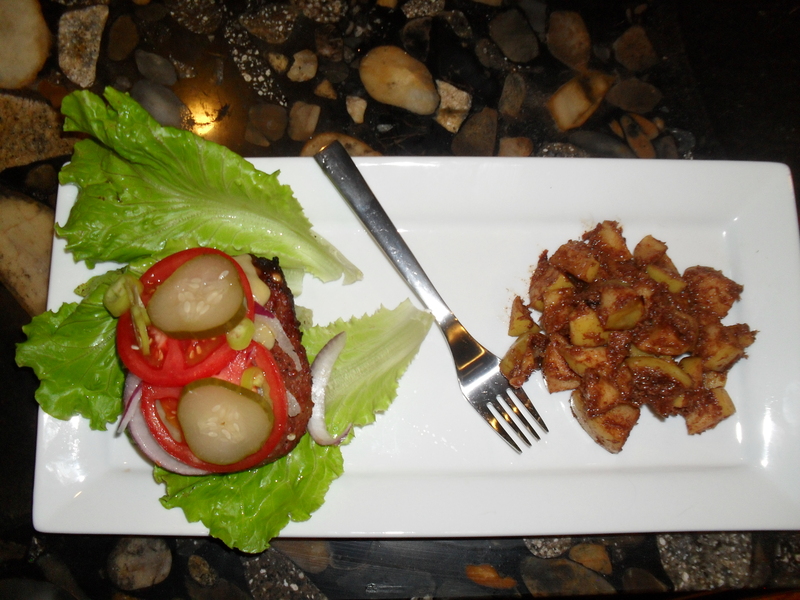 Your burger should provide a nice flat surface for piling high with toppings and the applesauce will have this amazing smoke infused flavor unlike anything you have ever experienced. The smoke is really what makes this stand out from your average grilled food, if you have never experimented with the flavors of wood smoke I recommend this as a great place to start. Seriously I can’t tell you how good it is, just try it! Like, now. When I was a kid we cooked everything over a wood fire. but since the gas grill I have forgotten how good everything tasted. I still have a hibachi in the shed ,will have to dig it out, and give this a try. Hurry up, go dig it out before it starts snowing up there! You only have a few weeks left!